Numerous changes in the field of fixed-telephony communications solutions have been witnessed in recent years. Fixed telephony services continue to increase in popularity, Voice over IP has become the standard and the number of parties supplying their own hardware to end users is declining as a result of acquisitions. 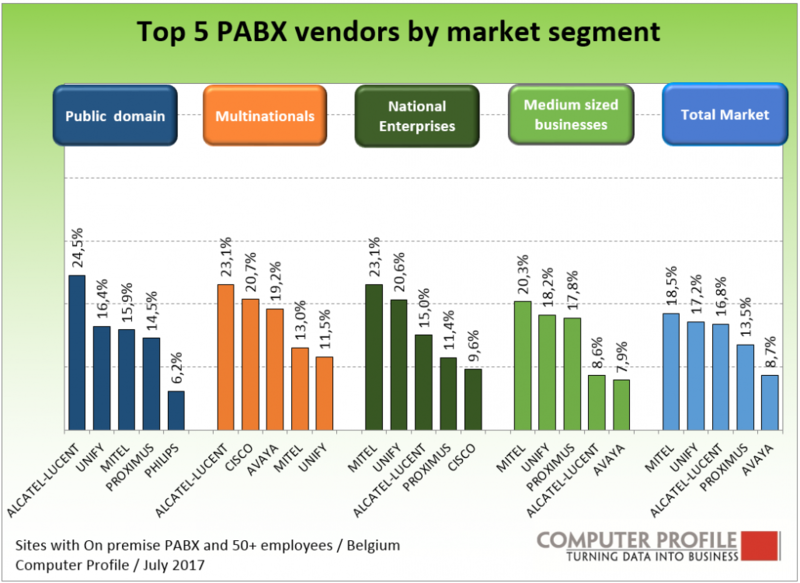 Three parties in the field of fixed telephony communications solutions within the Belgian business market stand out above the rest. Mitel, with just under 19 percent, is the most prevalent. Unify and Alcatel-Lucent follow shortly behind. We found both at approximately 17 percent of the interviewed parties. Proximus was found at approximately 14 percent of sites. Avaya concludes the top 5. Indeed, we encountered their systems at around 9 percent of those sites that still retain an on-site telephone exchange. These were the results of a Smart Profile analysis of approximately 3,800 interviews conducted with IT and/or telecoms personnel at Belgian business establishments with 50 or more employees. Some nuances are visible for the various market segments. Alcatel-Lucent has its strongest presence in public sector institutions and major commercial sites (Multinationals). Mitel enjoys the number 1 place at the sites of National Enterprises (250-2500 employees in Belgium) and Medium sized businesses (50-250 employees). It should be highlighted that the figures mention parties that are not communications solutions hardware or software manufacturers themselves. Rather, they supply solutions from other vendors. In many cases, the end users interviewed mention the name of the supplier/service provider, rather than the manufacturer. This applies to Nextel, Essec and, in particular, Proximus, for example. When the use of a particular vendor’s on-premise fixed-telephony communications solution (penetration) is not examined in isolation, and the capacity of the system based on the number of extensions is additionally considered, then the following picture emerges. What is immediately apparent, is that Mitel is the most prevalent party in terms of the number of sites, yet ranks number three based on the total number of extensions. 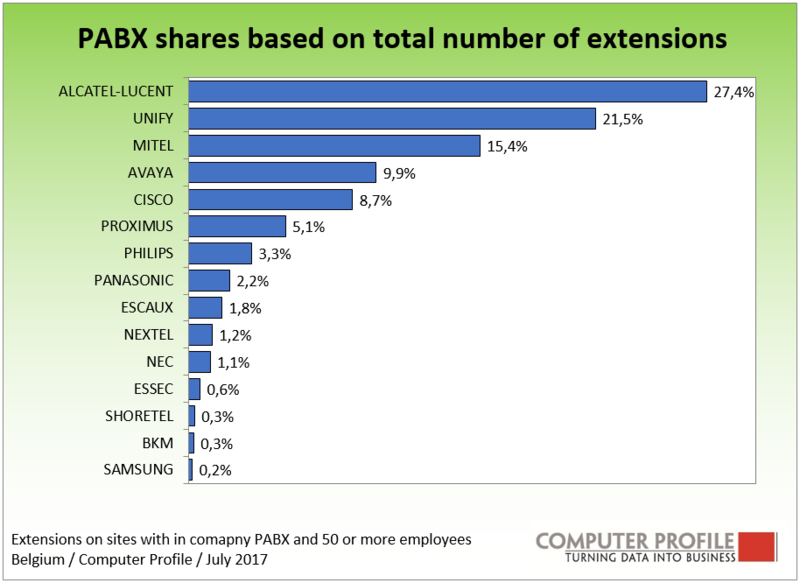 Alcatel-Lucent is the most widely used solution for major public organisations and multinationals, thus it takes the number 1 position when considering the share based on the number of extensions. Communications solutions for fixed telephony boast a relatively long life cycle. The average age of the installations encountered was approximately 7½ years. Thus, manufacturers who, in recent years, sold few new systems to the business establishments interviewed exhibit a higher average age, whilst those who sold more installations in recent years exhibit a lower average age. 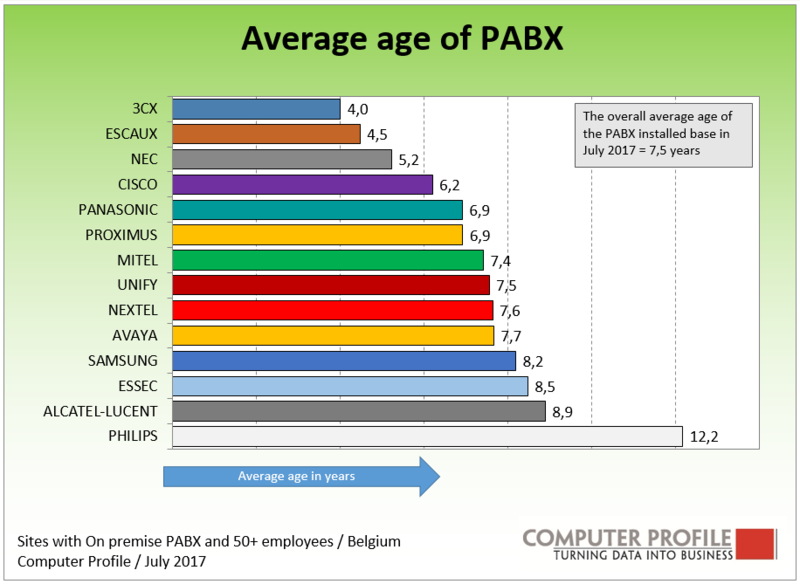 The systems from 3CX, Escaux, Nec and Cisco boast the youngest average age. In comparison to previous years, 3CX is a new name in the figure below. In order to outline the average age of a telephone exchange, we require at least several dozen interviews for the brand concerned. 3CX exceeds this threshold for the first time (however the numbers are still indicative, the same applies to Samsung). The oldest system by far is that of Philips. Such older systems are the first that are likely to be replaced. Whether that’s via an on-site communications server is, at best, questionable, in light of the increasing use of Hosted Voice. 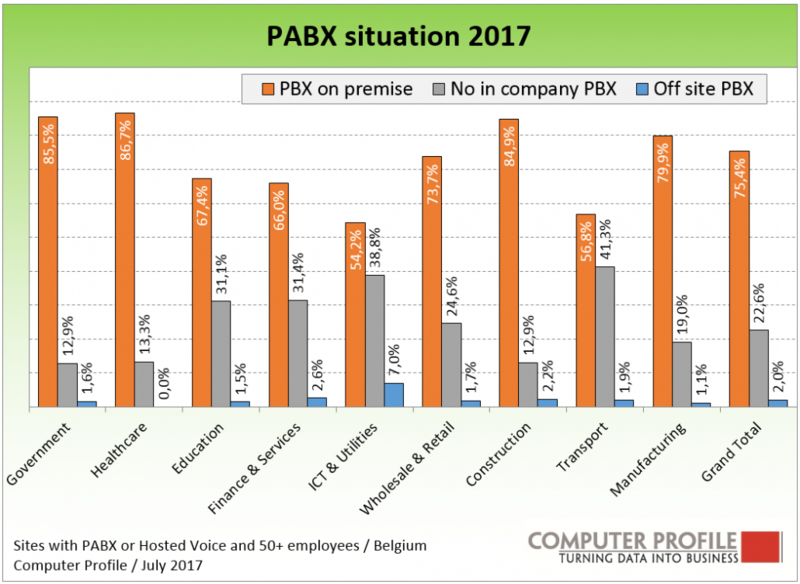 Approximately three quarters of the Belgium business locations interviewed indicate that they still retain an on-site telephone exchange. That percentage has fallen in recent years. Last year it was still around 80 percent, the year before, approximately 85 percent. In addition to using a local telephone exchange, some companies also make use of an exchange which, whilst located within their own organisation, is not on-site, but rather at a head office or sister site, for example. However, we rarely see this within the Belgian market and it applies to only a few percent of sites. Thus, around 23 percent of sites do not have a fixed telephony communications solution in the form of a local or company telephone exchange. These therefore make use of a solution supplied by a service provider. Whilst this can be a hosted voice solution, the fixed telephony solution may also fall under an outsourcing contract for example. When examining the use of a local telephone exchange, two segments immediately jump out; the transport sector and the ICT & Utilities segment, both of which make significantly less use of a local communications server than other industries. These two segments also make the most frequent use of an external service provider for fixed telephony services.